Rigid or semi-rigid round preshaped meshes (5 cm diameter), with eccentric or central eye. These are indicated for medium-large indirect inguinal hernias in males: they reduce the dimensions of an enlarged internal inguinal ring and reinforce the surrounding tissue. The T®4 Plug mesh, positioned under the transversalis fascia, links to a preshaped Hertra, which is positioned above the fascia. 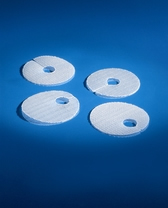 Round preshaped mesh (diameter 5 cm) with eccentric eye, to treat medium-large inguinal hernias in males: it reduces the size of the enlarged internal inguinal ring and reinforces the surrounding tissue. The mesh is woven with quadriaxial technology1, a process created and developed by Herniamesh which produces prostheses that are reinforced along the required direction. Mesh woven with this technology is therefore stronger, smoother and lighter, and maintains its shape under tension. It is also easy to handle and adaptable.